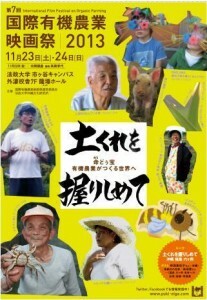 The 7th organic film festival will be held in Tokyo on November 23-24, 2013. This will be a great opportunity to catch up with recent trends and watch documentaries from Japan and abroad. The theme this year is “Holding on to the Soil” to refelct the hardships many farmers are experiencing, with special focus on Okinawa and Fukushima. For more information please check the official website (J). The Civil Society stakeholders for the Brunei round of TPP negotiations are very disappointed that no formal report from the Chief Negotiators was presented, nor the opportunity for stakeholders to ask questions in a forum where all could hear the answers. At this round of TPP negotiations the stakeholder session ended with a mingling of negotiators with stakeholders in a stand-up format. While we found the negotiators to be friendly and open to questions, the setting did not enable many stakeholders to ask their questions and the answers given were not available to everyone. Will there be another round of negotiations? Will a full timetable be released? We know there are inter-sessional meetings planned for September, what, if any, arrangements are being made for stakeholder engagement at these meetings? Will there be media brieﬁngs at the inter-sessional meetings? The Civil Society represented at the Brunei round consisted of a number of NGOs and community organisations who have very limited resources. To come to a negotiation round and not be able to question Chief Negotiators is a huge disappointment. We continue to urge for greater transparency and accountability, and we ask again for the release of a draft negotiating text.